At this year’s Spring Livery Dinner, the splendour of Apothecaries’ Hall was complemented by exquisite music emanating from a 1793 Mantegazza viola, played so beautifully by renowned recitalist and chamber musician, Virginia Slater. Dinner was a perfect symphony of delicately fragrant Thai fishcakes, accompanied by a 2017 Bergerac, followed by loin of Salt Marsh lamb with spring greens and a lively Valpolicella, and to close, we were tempted by Sicilian lemon tart with orange boodle and lime sorbet. The Master’s speech focused on the Livery’s charitable activities. From his recent visit to Treloars College, where he witnessed the caring, yet stimulating, environment the young, handicapped students enjoy, to the charity lunch on 20th July at his East Sussex home, in aid of the St. Michael‘s Hospice in Hastings. He also gave credit to PM Jeremy Brassington, on whose initiative the Helen Arkell Dyslexia Trust is now part of our charitable giving programme. The Master acknowledged the work of Liveryman, Ted Andrews, a leading manufacturer of modern felt products. He has been working with Lock & Co. to test a new felt product. In addition, Professor Chris Carr, Head of the School of Design at the University of Leeds, has met Jeremy Brassington and Nigel Macdonald to discuss possible collaboration between the University and our Company. The Master closed with a vote of thanks to PM, John Bowler, who has commissioned three important research papers into the early history of Feltmaking, assisted by Professor Harry Duckworth and Stephen Freeth. John’s daughter, Kathryn, collated and bound the finished work into three superb volumes. 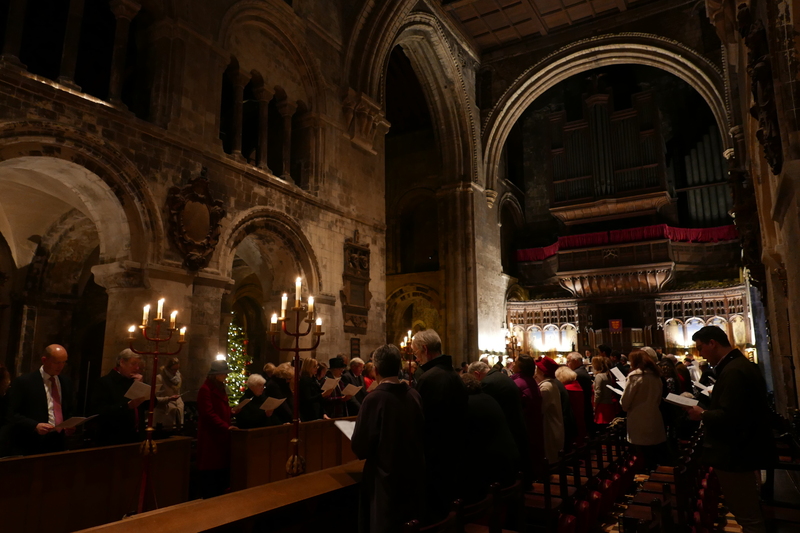 On a mild December evening, The Feltmakers gathered within the hallowed walls of St Bartholomew the Great for our annual celebration of the Lord’s Nativity. Our esteemed Chaplain, who conducted the Service, was joined by St Bartholomew’s Rector, The Reverend Marcus Walker. 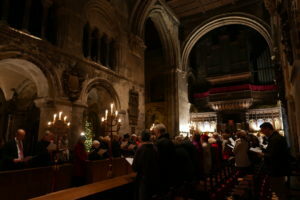 As ever, the resident choir led the congregation in a wondrous arrangement of traditional carols, interwoven with some glorious, less well-known versions. The Master, our Clerk, Wardens Gilly Yarrow, Nigel Macdonald and Simon Wilkinson,and Assistant, Simon Millar, each read a Lesson with great sensitivity and meaning. Company Chaplain, Andrew Pritchard-Keens, opened his Address in witty fashion by summarising the three stages of Christmas we experience through life: stage 1 –you believe in Father Christmas, stage 2 –you don’t, stage 3 –you are Father Christmas! He went on to muse about the Lord’s relationship with His parents as He grew up, a period of His life about which we know very little. Did His Mother Mary, explain the nature of His birth to Him? Did His father Joseph explore the firmament with his curious son? Did Joseph carve wooden toys for his child? Many of us were humming Silent Night or O Little Town of Bethlehem as we made our way to Habersdashers’ Hall, where a delicious buffet supper awaited us. This year, we had the pleasure of including guests from our sister Guild from Zurich, the Zunft zur Waag. They will also be joining us alongside The Feltmakers’ Float when we process at The Lord Mayor’s Show on 9 November 2019(an important date for your diary). 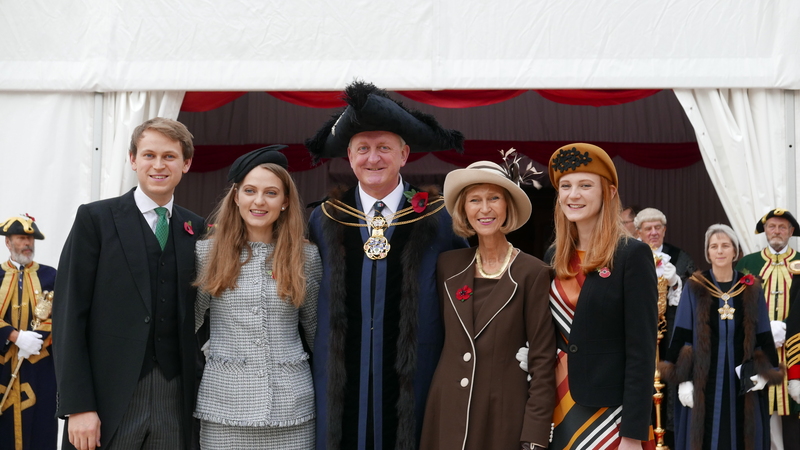 Read more..
On the following Tuesday after the Lord Mayor’s Show, a smaller more intimate ceremony takes place at Mansion House. 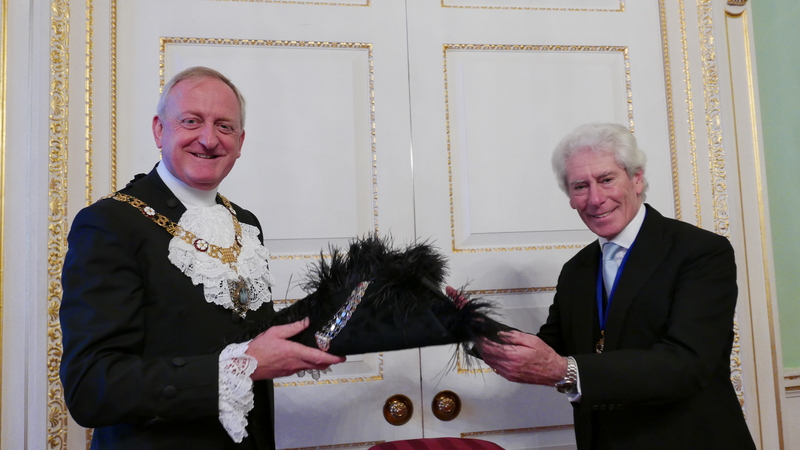 It is the presentation of the traditional feather trimmed tricorne hat to the new Lord Mayor of London by the Master of The Feltmakers Livery Company, which will be worn by the mayor at all formal occasions throughout the year. It is a style that dates back to the 17th century, when it was designed and worn for protection. In fact the can be traced back to 1695, when the French Huguenot Corne family arrived in London bringing with them the skills of Parisian hat making, eventually putting their name to the ‘tricorne’ hat, which remains today. The Master and Wardens of the Feltmakers assembled in an upper room to greet the Mayor and his wife. 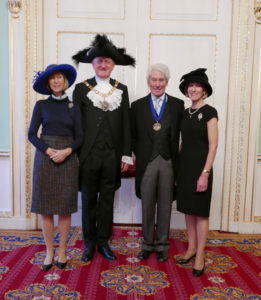 There is no fanfare or pageantry, just a simple handover of the hat to the Lord Mayor and presentation of a silver hat pin to the Lady Mayoress. Using traditional hatting processes Patey of London have now made 30 Mayoral tricornes. The process begins with a foundation of four layers of stiffened calico. The crown is then covered with fur felt, whilst the brim has a wool felt inner and a velvet plush outer. When the shape is complete the hat is trimmed with black ostrich feathers and decorated with a wide gold chain. On the 29th of September each year (Michaelmas Day) the Liverymen of the City of London elect a new Lord Mayor. This year Alderman Peter Eslin was elected and became the 691st Lord Mayor of London. 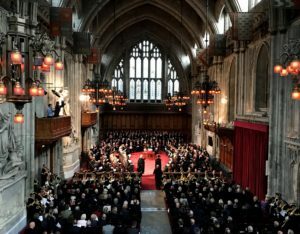 On the Friday before the second Sunday in November the new Lord Mayor was sworn into office, at the Guildhall, at a ceremony known as Silent because, apart from the vow of the incoming Lord Mayor, it is held in total silence. Silence that is apart from the heavy tread of the officers as they process in and out of the Guildhall. 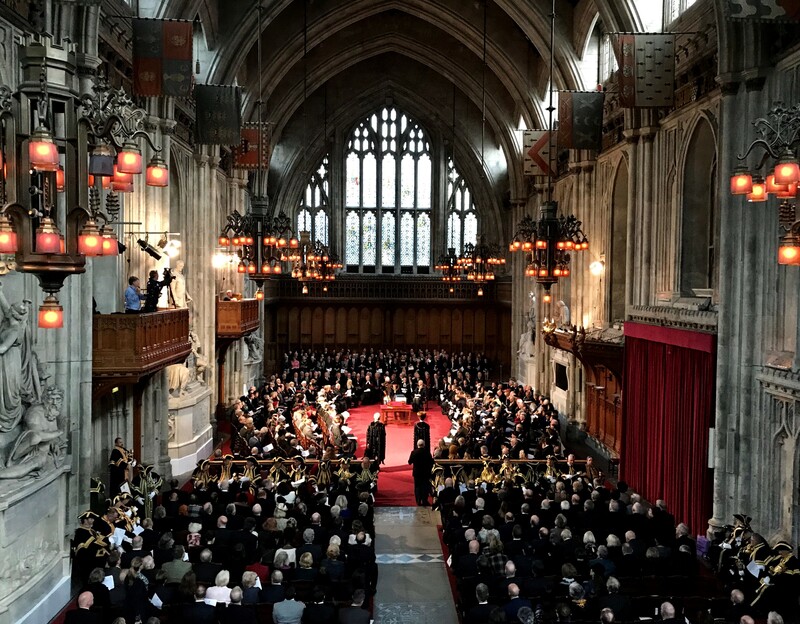 The ceremony was witnessed by the Aldermen, the City officers, Masters of Livery Companies and hundreds of their fellow Liverymen. It was as rich in pageantry as it is ancient in history and though it only lasted some twenty minutes or so it was a great piece of theatre. It started with the procession into the hall of The Lord Mayor’s and Sheriffs’ Committee followed by the other City Officials, then the Aldermen, and finally the Lord Mayor Elect, the City Marshal, The Lord Mayor’s Chaplain and the outgoing Lord Mayor, the Rt Hon Charles Bowman. The Lord Mayor-Elect, Alderman Peter Eslin, swore his oath of office. The outgoing Lord Mayor then moved to his left and summoned the incoming Lord Mayor to his seat. The new Lord Mayor then donned his tricorne hat and exactly simultaneously the newly late Lord Mayor removed his, thus symbolising the transfer of power. The officers then took it in turn to present their symbols of office, the Sceptre, Seal, Purse, Sword, Mace, Collar of Esses and Badge, each one taking three steps forward, then bowing, then presenting the symbol. The new Lord Mayor touched each one in turn and then the officer took the symbol and walked backwards, bowing, essentially reversing the process. 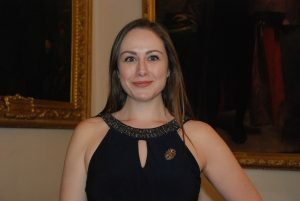 Then the incoming Lord Mayor undertook to safeguard the silver and furniture at Mansion House, signing for the “plate”. All this was watched by the huge audience in reverential silence. Both power and responsibility had been smoothly transferred. The verbosity of endless speeches of congratulation was unnecessary. Congratulations were offered but just with handshakes and smiles, but still all in silence. The processions then went out in reverse order, with the new Lord Mayor triumphantly in the lead. 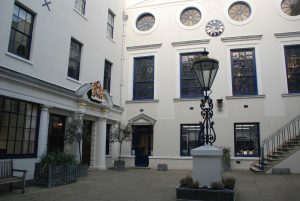 Tucked away behind the Bank of England, Drapers Hall stands on the site of Thomas Cromwell’s grand city palace which was acquired by the Drapers in 1543. The current hall comprises a succession of elaborately decorated formal rooms enclosing a secluded courtyard garden. 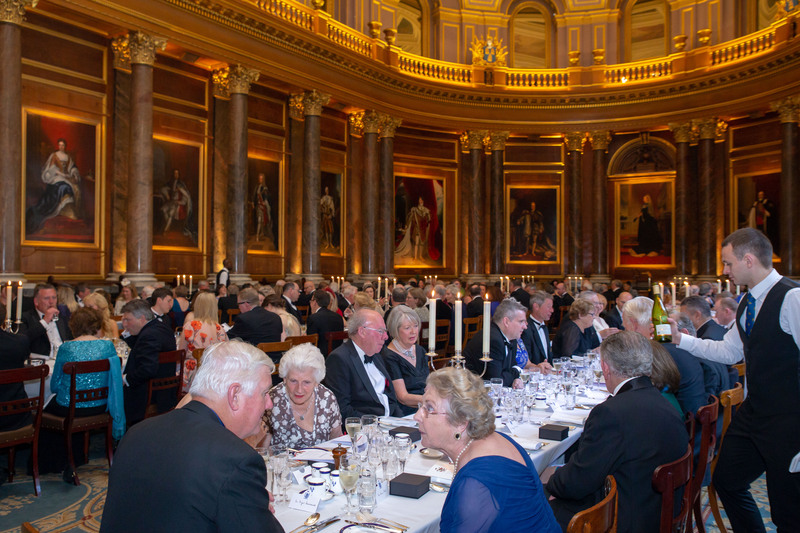 It was here on Friday 1 June that a record number of Feltmakers and their guests gathered for the annual Banquet. Pre-dinner there was an opportunity to admire the court rooms and also to see at close quarters the finalists of the 2018 Feltmaker Award. A collection of stunning hats were on display along with the accompanying art work, an incredible diversity of designs. 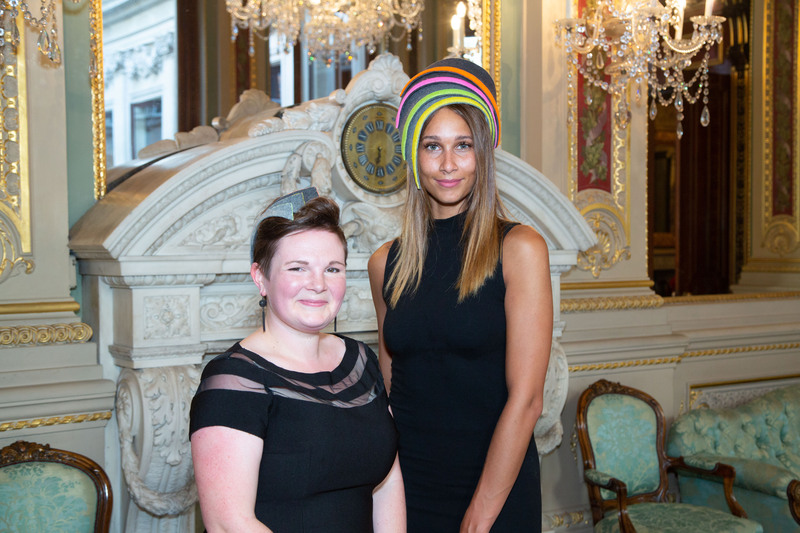 The winning hat, designed by Elizabeth Yates, at first glance appeared to be very simple but deeper examination revealed a great deal more both in terms of technical and design skills. A very well deserved winner and a hat admired and indeed coveted by very many of the attendees. We dined in the ornate livery hall, adorned with portraits of British monarchs a room which has often been used as a film set including as a double for Buckingham Palace. 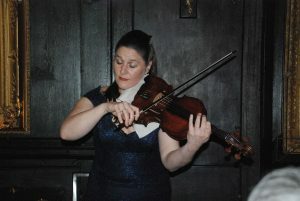 Serenaded by musicians from the HAC Regimental Band we enjoyed a delicious meal and excellent wines expertly served by the team from the Hall. As ever, the ceremony of the Loving Cup caused a great many smiles and laughter.